It’s Alicia today, just checking in to thank Cassie and Rachel for all of their help these past few weeks. They’ve done an amazing job, and I’ve been lucky enough to get to taste some of these delicious treats. I haven’t baked in over a month so I’m going through some serious sweets withdrawal. 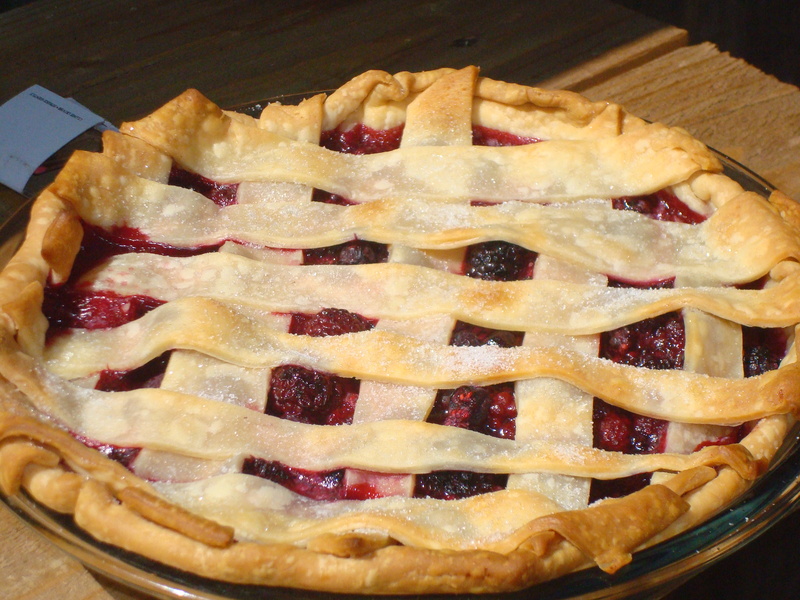 Therefore, this week is a double dose of recipes, with a blackberry and raspberry pie recipe today and Rachel’s tutorial of how to carve a cake later this week. I wanted to share this recipe for a pie that my lovely friend Teresa made for a barbecue, because it was so delicious and easy to make. Everyone else was outside eating hot dogs, playing games and being social. I was in the kitchen eating pie. I guarantee I was enjoying my time more than most people there. Keep reading for the recipe for the busy woman who wants a delicious dessert…. A few additional handfuls of brown sugar and granulated sugar. (1) Lay one of the Pillsbury dough sheets in a circular pan to be the base. Press the dough against the pan to make certain that the dough keeps its form once you put the filling in. Fold a sprinkling of brown sugar and granulated sugar into the edges of the base crust. (2) In a large bowl gently mix together the blackberries, raspberries, sugar and all-purpose flour. Make sure that the sugar and flour are completely mixed. You likely shouldn’t see any white spots, since the juice from the blackberries and raspberries will make it a thicker purple color. Once completely mixed, pour the mixture into the pan with the base crust. Make sure the mixture is evenly distributed throughout the pan. (3) Cut the second sheet of dough into 10 even strips. Place five strips horizontally. A method I use to make sure it stays as even as possible is to start with the edges. Place one strip on each edge. Then place an additional strip in what seems to be the middle of the two outer strips. Lastly, place the last two strips between the middle and end strips. Repeat this process with five strips vertically. (4) Bake at 425 degrees for 15 minutes. After 15 minutes, reduce the temperature of the oven to 350 degrees and bake for additional 20 to 25 minutes (until the top begins to turn a nice golden brown).